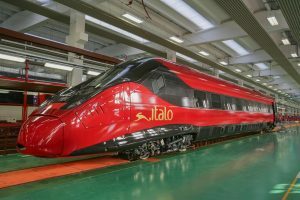 NTV SpA is the first private operator on the Italian high-speed rail network. With its fleet of 25 trains Italo travels along the Italian high-speed rail network which comprises 13 cities and 18 stations: Salerno, Napoli Afragola, Napoli Centrale, Roma Termini, Roma Tiburtina, Firenze, Bologna, Reggio Emilia, Milano Rogoredo, Milano Centrale, Torino Porta Nuova, Torino Porta Susa, Padova, Verona, Venezia Mestre, Venezia Santa Lucia, Brescia and Ferrara. Recently commissioned, the Alstom EVO fleet will combine with the current fleet of 25 Alstom AGV, taking the total number of Italo trainsets up to 37 (Italo bought 12 new Pendolino trains, they will be operative within summer 2018 and they will cover new routes like Torino – Venezia). Italo also provides its travellers with an innovative intermodal transport service, ItaloBus, which combines bus and rail routes connecting Reggio Emilia AV Mediopadana to Parma, Cremona, Modena and Mantova; Milano Rogoredo to Bergamo, Capriate and Orio al Serio airport; Salerno to Picerno, Potenza, Ferrandina, Matera, Taranto, Frascineto (Castrovillari), Sala Consilina, Lauria and Cosenza; Verona Porta Nuova to Rovereto and Trento. Italo, which always supports and sponsors the most remarkable Italian cultural events, gives its travelers the chance to reach the most important art heritage and touristic cities throughout Italy. 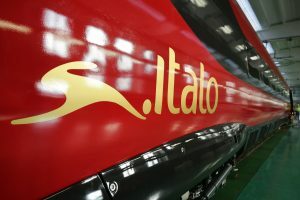 Italo Ticket are available through any Italo sales channel: italotreno.it website; italotreno app for mobile devices, Pronto Italo Contact Center (06.07.08), authorized travel agencies and self-service ticket sales machine in all stations covered by Italo train service.